Qualify for more surveys with your profile information! It is no doubt frustrating when you are screened-out from surveys. To increase your chances of qualifying for as many surveys as possible, please make sure that the information in your basic profile and Profile Surveys is complete and up-to-date. We use this information to find surveys that are right for you. So the more accurate information you give us, the more surveys you will be qualified for. To update your basic profile, login to your account and place your mouse cursor over the text that says “Welcome [username]” at the top right side of the website and then select “Account”. From there, select “Personal Details” from the side navigation tabs. Enter or update your details in the relevant fields and then click the Save button at the bottom of the page. Apart from keeping your basic profile information updated, ensure that you also update your Profile Surveys. 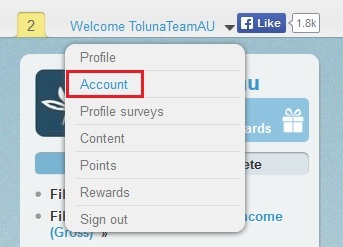 These can be found by going to “Surveys” and then “Profile Surveys” in the main top navigation bar of the website. From there, you will find specific surveys about different aspects of your life. These allow us to know more about your home and financial status, your preferences and lifestyle, so that we can send you more surveys that you will qualify for. Ultimately if you qualify for more surveys, you will be able to earn more points faster! If you are completing the Profile Surveys for the first time, you will also earn 100 bonus points for each survey completed. If your circumstances change, be sure to update the information in your profile as often as you can. This is important because you are more likely to be screened-out of a survey if the information in your profile does not match the answers that you provide in the survey’s screening questions at the time, and you will not qualify for the full points. We hope that this information will help you to qualify for more surveys and earn more points. Feel free to contact us if you have any queries about your Profile Surveys and other profile information.